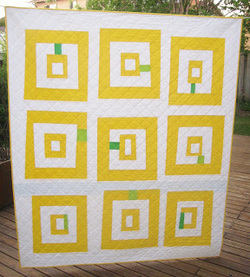 Quite simply I quilt because I have a strong desire to make things. I always have. Twenty years ago I bought a sewing machine on a whim and thus my sewing journey began. I love making quilts because it allows me to have the creative freedom that I crave whilst making something that is utilitarian. I love to see my loved ones wrapped up in a quilt that I made! Inspired by modern art, my style is defined by simplicity of form and design, allowing color and simple shapes to convey a message that is upbeat and heartfelt. I employ liberated and improvisational techniques in my approach to making and designing quilts. I live in Montreal, Canada with my husband and our 2 children. I am the co-founder and president of the Montreal Modern Quilt Guild and a member of Courtepointe Quebec Quilts. My work has been published in Stitch Magazine, Modern Quilts Unlimited , Quilty Magazine, Quilter's World, and in Sew Gifts!, a book published by Martingale Publishing. I am a sewing and quilting instructor at Courtepointe Claire. My classes include Quilting 101, Sewing 101, and an introduction to Modern Liberated Quilting. 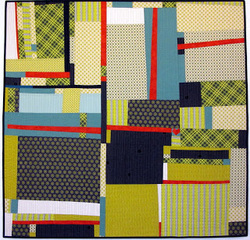 "Craving a Little Sunshine", Modern Quilts Unlimited Magazine. Best of Quiltcon Travelling Quilt Show.